Rumors of war continue to abound in the Middle East, especially when it involves the nations of Israel, Syria and Iran. However, this is not a new phenomenon. Saber rattling has become the soundtrack resonating throughout the Middle East since the last major Arab-Israeli war of 1973. This 2007 news headline below is just one of many examples of this reality. Compare this past headline with a recent one that also underscores Israel concerns about Iran. Tehran will not be allowed to put ‘noose of terror around our neck’, PM says in Munich speech. However, a flurry of recent regional events is trumpeting a NEW and credible alarm for Israel. Isaiah prophesied the destruction and abandonment of Damascus, Syria over 2,700 years ago. Yet the city continues today, despite so many Middle East wars and predictions that “this year” it will finally come to pass. So what’s missing that has been holding this prophecy back? Israel’s strike on Iran? Or perhaps the overlooked prophecy in the Psalms about a future Arab war alliance targeted at wiping out Israel. Damascus, Syria, Iran, and an Arab alliance targeting Israel are all topics in the news today. Is it possible that Ancient prophecies are about to roll off their parchments and pound down on the Mideast pavement? If so, which ones, when will they happen and how will they impact the world? Current events seem to indicate the winds of change are moving the clouds of war directly over Israel’s landscape. Over the past few months a flurry of noteworthy first time political and military events have happened concerning the Jewish state. 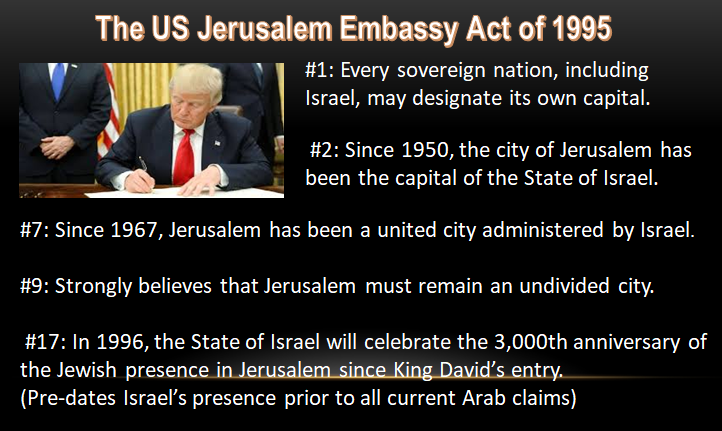 One such political event was President Trump’s decision on December 6, 2017, to acknowledge Jerusalem as Israel’s capital. On April 6, 2017, Russia had previously acknowledged only West Jerusalem as Israel’s capital, but this was the first time that a significant nation recognized Jerusalem, without dividing the city, as the capital of the Jewish state. This move sent shock waves throughout the global community in general and the Muslim world specifically. Promptly after Trump’s bold decision, the 57-member OIC (Organization of Islamic Cooperation) convened and conveyed their opposition on December 13, 2017, by acknowledging East Jerusalem as the capital of a future Palestinian state. Then, on December 21, 2017, the UN met and by a vote of 128-9 passed a resolution strongly condemning Trump’s announcement. This UN decision represented a nonbinding resolution calling on countries to avoid moving their embassies to Jerusalem. Donald Trump is expected to formally recognize Jerusalem as the capital of Israel today, sparking fears that war could break out in the Middle East. Since this Jerusalem issue, the Palestinians have publicly denounced America as a legitimate Mideast peace broker and the US has cancelled much of its funding for the Palestinians. What’s NEW with Syria and Iran? 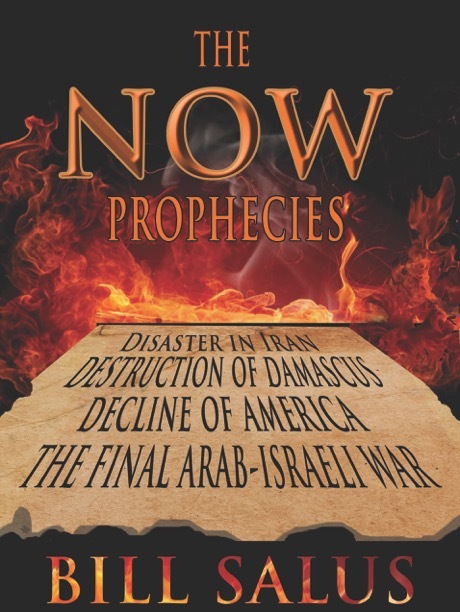 In my recent article entitled, Prophecies and Headlines Hint of a Coming Israeli-Syrian Conflict, I point out how new developments occurring in Syria suggest that the biblical prophecies concerning the doom of Damascus are set to happen. There are a flurry of attention getting events, including unprecedented first time occurrences, that have happened that reinforce this prophetic possibility. Israel striking Syria is nothing new. During the seven-year Syrian civil war, Israel struck inside of Syria multiple times. However, as these three headlines depict, confrontations between Israel and Syria are lately occurring on almost a monthly, if not weekly, basis. Moreover, they are increasing in their intensity. Most troubling are the events of February 10, 2018. The day started with Iran sending in one of its drones to spy over northern Israel. The drone was promptly struck down by an Israeli helicopter. The flare up on the northern border marked the first direct confrontation between the Israeli air force and the Iranian regime on Israeli territory. Shortly after taking down the drone, the Israeli Air Force sent in eight F-16 fighter jets into Syria to destroy the mobile command center from which the Iranian drone was sent. Having successfully taken out the command center, it became the first time that Israel struck inside Syria where known Iranian soldiers were stationed. 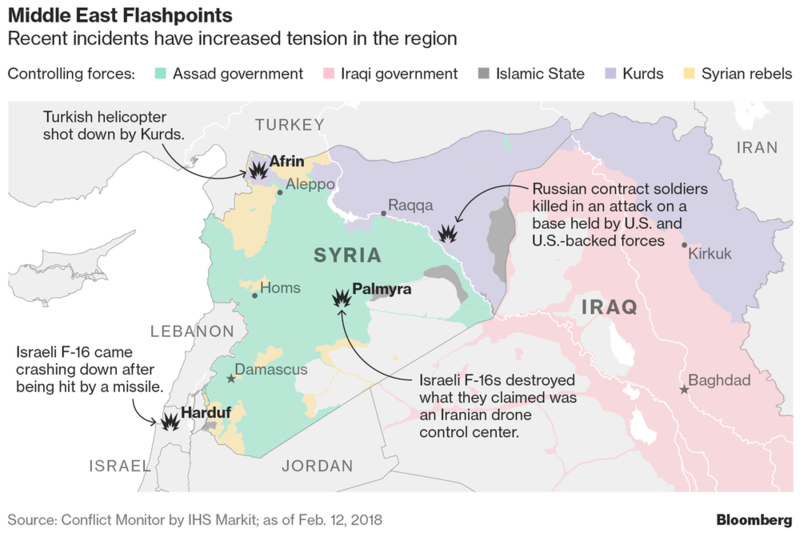 The Middle East Flashpoints image points out that this Israeli attack on the Iranian drone center was well into the heart of Syria. In retaliation, one of the Israeli F-16 fighter jets was struck by a Syrian anti-aircraft missile causing it to crash to the ground. Amidst the numerous Israeli attacks in Syria during its revolution, this was the first time that Syria struck down an Israeli jet. In fact, this was the first time in decades that an Israeli fighter jet had been taken down by enemy forces. The string of these confrontational events is what prompted Hebollah’s Secretary General Hassan Nasrallah to say this marked the beginning of a new era, which was a headline quoted above. What are the potential geo-political and prophetic implications of Nasrallah’s statement? Prior to and throughout the duration of the above events, I was authoring a book about the Psalm 83 prophecy. Whether the correlating timing of all these three events above was providential, they were only coincidental to me at the time. I didn’t realize the potential connection between these events until several years later. Meanwhile, the related Psalm 83 book was released in 2008 under the title of, Isralestine, The Ancient Blueprint of the Future Middle East. 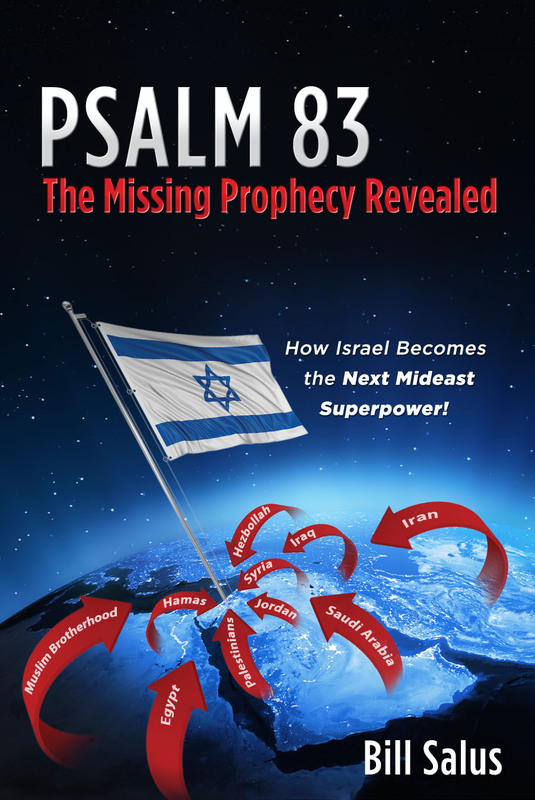 The book became a primer work for introducing the Psalm 83 prophecy and was updated in 2013 and released under the title of Psalm 83: The Missing Prophecy Revealed, How Israel Becomes the Next Middle East Superpower. Presently, Iran has been instrumental in arming Hezbollah with approximately 150,000 advanced missiles, all of which can be targeted at Israel. It is estimated that in the next Israeli-Lebanon war that Hezbollah could launch about 1000 missiles per day into all of Israel. This would be an unsustainable attack for Israel, who has publicly stated that such a war would end up with a decisive Israeli victory. Home Front Command says Israel should brace for hundreds of civilian casualties in event of a conflict. However, Hezbollah is an agent / proxy terror group of Iran and the Iranians predict that Israel will be destroyed in the next Hezbollah conflict. Iran recently declared that it would attack Tel Aviv if Iran was attacked. By extension, this could be an attack in Iran or perhaps a war with Hezbollah. 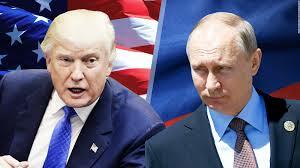 Another disturbing recent event with potential prophetic implications concerns Russia. Russia is the subject of a prophecy written about 2500 years ago in Ezekiel 38. This prophecy may also include America pictured as protesting Russia’s military campaign against Israel within the prophecy. The prophecy identifies a group called the “young lions” of Tarshish, which I explain in my book entitled, The Now Prophecies. Russia, along with Iran and Hezbollah, has played an active role in helping Syrian President Bashar Al-Assad to stay in power. Russia’s involvement in the Syrian civil war essentially tipped the scales toward Assad’s victory in that revolution. Now that this war is winding down, Iran is knowingly attempting to build a corridor, with Russia’s support, that runs through war-torn portions of Iraq and Syria to connect Tehran to the Mediterranean Sea. This concerns both Israel and America and is one of the reasons that President Trump has decided to maintain an American military presence in Iraq in the aftermath of the Syrian revolution. Evidence of America’s concern was recently displayed in an attack inside Syria that killed Russian fighters. The location of this attack is displayed on the Middle East Flashpoints image above. This confrontation represents another unprecedented event. It is the first time that America has killed scores of Russian fighters in the Middle East. U.S. forces killed an estimated 200 Russian mercenaries (contract soldiers) in Syria last week in what may be the deadliest clash between citizens of the former foes since the Cold War, according to one U.S. official and three Russians familiar with the matter…The Russian assault may have been a rogue operation, underscoring the complexity of a conflict that started as a domestic crackdown only to morph into a proxy war involving Islamic extremists, stateless Kurds and regional powers Iran, Turkey and now Israel. What’s NOW in the Mideast? Now that we have visited what’s NEW and alarming in the Middle East, let’s explore the prophecies that could be triggered now, at the present time in the region and in the world at large. In my book entitled, The Now Prophecies, I list the ancient biblical predictions that are set to happen presently. These are the prophecies that lack any further preconditions. The stage is set for the fulfillment of these events in the near future. In other words, they could happen NOW! • Vanishing of the Christians – (1 Corinthians 15:51-52, 1 Thessalonians 4:15-18). 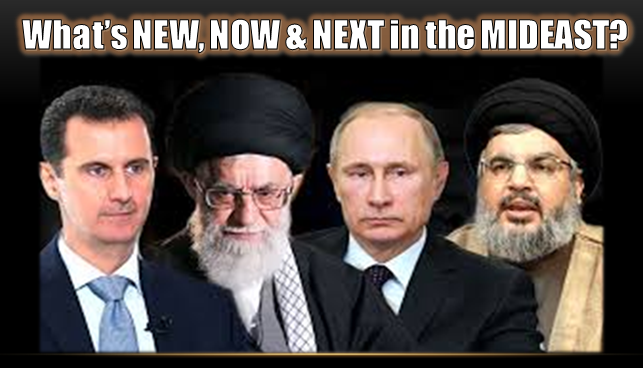 What’s Next in the Mideast? Now that we have explored and explained what NEW and NOW in the Mideast let’s preview what could happen NEXT in the region. 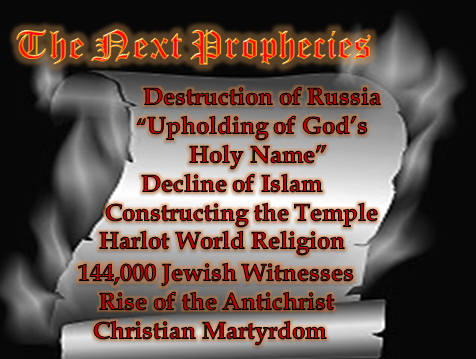 The NEXT prophecies are those predicted events that follow the fulfillment of the NOW prophecies. Although the stage is nearly set for the NEXT prophecies to happen, they still have some preconditions standing in the way of their fulfillment. One of the NEXT prophecies includes the Ezekiel 38 invasion of Israel alluded to earlier. This prophecy has some preconditions that prohibit it from being an imminent event. These yet to be fulfilled details are identified in the Psalm 83 and Apocalypse Road books and in these two Internet articles below. Psalm 83 or Ezekiel 38, Which is the Next Middle East News Headline? 5. A people who have acquired “great plunder” (Ezekiel 38:13). As this article points out, Israel is not presently “dwelling securely” as a “nation at peace in the Middle East.” Nor are they “A people dwelling without walls, bars nor gates.” Presently, Israel has a partition wall that spans approximately 440 miles that was constructed to protect Israel proper from Palestinian terror. Additionally, Israel has multiple security checkpoints in place throughout the country. Powerful unprecedented events are occurring in the Middle East that seemingly signal that the fulfillment of ancient predictions could soon result. It encourages the concerned individual to daily watch their news and read their Bibles to obtain a wholesome understanding of current world events. Several hundred years ago people could perhaps justify ignoring the prophetic perspectives presented within the Bible, but today that’s not advisable. Bible prophecy is a gift to mankind from a loving God. It is timely and relevant information for today that is 100% accurate because the Lord, its source of information, knows the beginning from the end. Daniel 2:21 informs us that it’s the Lord who changes times and seasons and He gives wisdom to the wise and knowledge to those with understanding. The times and seasons are undoubtedly changing as evidenced by escalating Middle East events. Thus, it makes most sense to enhance our understanding of world events by incorporating the wisdom and knowledge available to us that is written within the details of the biblical prophecies.